Tasks are grouped by the name of the site that they exist on. There is built in conditional formatting that shows overdue incomplete items in red. There is a checkbox next to each task to be able to quickly mark it as complete, which automatically sets the task status field to completed. There is a little exclamation mark next to each task, to quickly mark some as important. This is not related to the task priority field at all, though. When you click the ellipsis next to any task, a pretty pop up shows more info, and you can add to or remove the task from the timeline. This view shows a timeline at the top (and it’s color coded per task list). All of the tasks with the red exclamation mark for important are shown at the top, and the upcoming ones (14 days is the default) are shown below. This view is shown in the first screenshot at the top of this post. These are tasks that are incomplete. Tasks will show in this view for 1 day after they have been added or modified. When you click the ellipsis next to the names of views, just like everywhere else in SharePoint 2013, you’ll see the names of more views that aren’t already displayed. You have some filter options. The items listed here are the various task lists that are being rolled up. Take a look at the Tasks tab in the ribbon! (seen above) There are more options there. As usual, there are multiple ways in SharePoint to get the same thing done. Here is where you can quickly complete tasks, mark them complete, etc. You can also choose whether or not to show tasks as grouped by project, or connect this list to Outlook. The settings button has a plethora of options available, and this leads to the title of this blog post. There’s color coding! All of the settings in here are fairly self-explanatory. And of course you can change which color represents each task list! When you click on each color box itself, it brings up an interface that lets you choose any color in the color wheel. When go back to the task list and click Edit Page on the Page tab in the ribbon, and open the properties of the tasks web part (Edit Web Part), this is where I have a couple more options. There is a drop-down box that lists all of the views that exist on that task list (rollup of task lists), and you can pick which one you want to be the default. Show refresh status will show the date and time at the bottom of the task list, which indicates when it was last updated. Show View Selector will let you determine whether or not to allow end users to switch between views. You can also use this web part anywhere in SharePoint! Go to the Tasks page on your About Me site. Click Edit Page on the Page tab. Save this .webpart file to your desktop or something, and remember where you put it. Go to some other page in your SharePoint environment, your intranet homepage or anything. On the Page tab, click Edit Page. Click to Insert a web part. On the left side where all of the web part categories are listed, click Upload a Web Part. Click the Browse button and navigate to the .webpart file that you saved at step 3. Click Upload. Click to Insert a web part again. This time the first category in the list of categories will be Imported Web parts, and you’ll see your web part in there. Use the Add button (toward the right) to add it to your page. Note that when this web part has been placed on another page like this, none of the links to the views will work anymore. This will be a great time to use the setting I covered above in the web part properties (Edit Web Part), UNCHECK ShowViewSelector. This is a great article. I’ve seen some requests for creating a rollup of all of the tasks due from employees of a manager, so that the manager can have a dashboard of what his group is working on. (http://social.technet.microsoft.com/Forums/sharepoint/en-US/15b1699d-0d63-4b2a-baa7-24efa305dd82/task-list-rollup?forum=sharepointgenerallegacy) If you export the webpart does it break if you import it into a different site? This is cool! Very useful for entities, like IT which can be a part of a handful of projects at the same time. As relevant as it gets for real world scenarios!! Nice!! It appears to export and import just fine. No matter what I try I cannot get any tasks (outside of mysite) to show up on the tasks page. Nothing under the projects section of “settings” either. The other site are migrated from 2010 – could this be a reason? Mysite is also on a different web application if this makes a difference? Related to this, I put the my tasks web part (OOTB not exported) on the home page of ourportal and that shows 0 tasks – not even the mysite ones. This is based on search, so make sure that the whole farm and both web apps are being crawled and those tasks are searchable with any regular search done in SharePoint. Both web apps being crawled fine and tasks showing up from main search results page. When I click the ribbon/tasks/settings from the tasks page (in my mysite), the projects sections says: You don’t have any tasks from projects right now. However I have gone out to 2 other site collections and added tasks (and assigned to me) – but nothing even though they were added a while back. Only issue is that I cannot see the task menu in my quick launch? Is this function only for certain versions of SP 2013? I have a subsite that has the “Tasks” app added. This shows a list of tasks, and a timeline. I can add tasks to this list and assign them to people, and add them to the timeline, and they appear in both the list and the timeline. If I add a task and assign it to myself, and then go to my MySite page, and then click on the Tasks, page, I see the structure you refer to above but nothing is listed there at all. I waited until the site was crawled, and still nothing shows up there. So, how do we make it work so that the “Tasks” app connects with the “MySite” Tasks web part? Or is this not possible? Can you change the functionality of the check box that marks task 100% compete? It’s easy to click by mistake and when you deselect it it changes the % complete to zero. I’d like to change the functionality or remove it from the content type. Is it possible to get the % complete to display on each of the timeline tasks? I’m struggling with the same issue Doug is experiencing. When I go to My Site, I see all my OneDrive docs, but no tasks… If I use the top level ribbon to switch between Mail, Delve, etc. 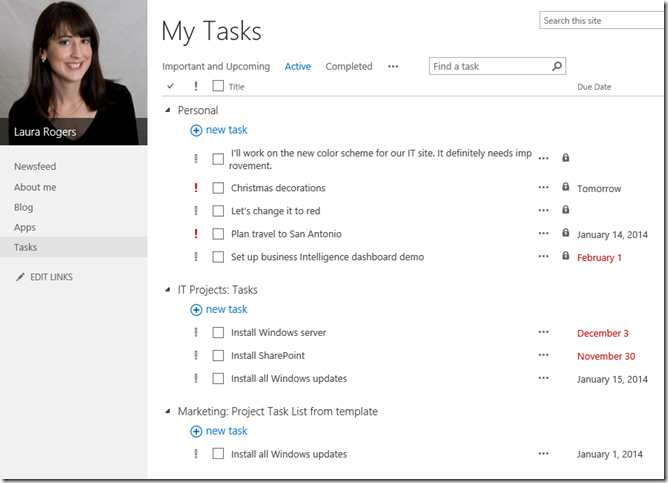 there is an option for Tasks but it only shows Tasks I have in Outlook, not in the Tasks SharePoint app. I have SP2013 Online which may be the problem? Thanks! Great article, and inspired to make this work. Where does the “Personal” task list reside? I would like to be able to export to excel. I cannot find it in site contents or anywhere else. You rock Laura! I’ve learned so much from you! Thanks for doing what you do. Wonderful article – another onre from the (endless) series: “helping me out”. Browsing some internet sites, I am concerned that the “My Tasks” and rollup content have been deactivated at SharePoint Online. If this is true, how to overcome this? Is there a way I can color code the summary tasks based on the dept., in the “tasks” list of a subsite and not “my tasks”? I have no Tasks link there in Sharepoint online. Can I try to reach it by direct link? Please advise. Laura, Is the Tasks view no longer available? I’m using O365 SP 2013 but TASKS does not show up in my quick launch?